Chelsea fell to an appalling 2-1 defeat at the hands of Crystal Palace on Saturday as the Blues were embarrassed by their London opponents. Roy Hodgson’s men were goalless and pointless before the clash, but they somehow managed to score two goals against a Chelsea side lauded for their defensive ability. Ultimately, Antonio Conte and his men were left red-faced by the loss. The defeat has left Chelsea languishing in sixth in the Premier League with 13 points, nine short of Manchester City. 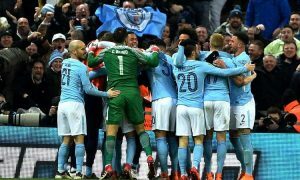 The loss was as damaging for their own egos as it was for their league position then, with the gulf in class between the Blues and City now represented in the table too. The fans would probably argue that Chelsea were missing a number of key players, but surely that shouldn’t mean that much as the Blues should not lose to a side that had not picked up to a point before this weekend. Are Chelsea weak in key areas? 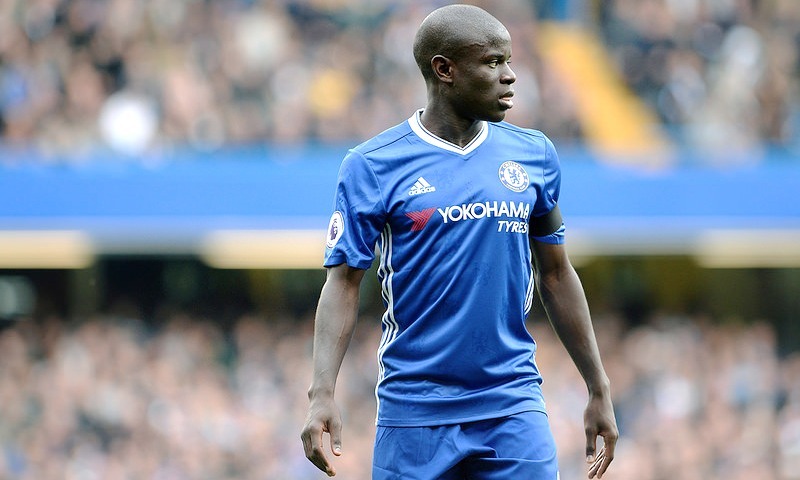 There were two notable absences on the Chelsea team sheet before kick-off, with N’Golo Kante missing in midfield, while Alvaro Morata was unable to feature at the point of attack. The former has proved to be Chelsea’s most important midfielder, while the latter is undoubtedly their best striker following the exit of Diego Costa. With the two missing, gaps started to appear in midfield and chances were spurned up front. While it is impossible to know whether the two would have definitely led the Blues to victory, they would have surely plugged key areas in the side. Indeed, Kante and Morata’s replacements in Cesc Fabregas and Michy Batshuayi do very different jobs to the two injured players. While Fabregas was very good against Palace as he kept possession well and put in a number of intelligent through-balls that his teammates failed to make the most of, he is not the same defensive force as Kante. Batshuayi was lambasted by Chelsea’s fans for his performance as he was anonymous throughout much of the game. In a rare start for the Belgium international, the supporters would have assumed the striker would look to chase every lost ball, make himself big and strong for knock-downs and work openings for himself and his teammates. In reality, he was very poor on the day as he failed to inspire, which only made the absence of Morata more evident. 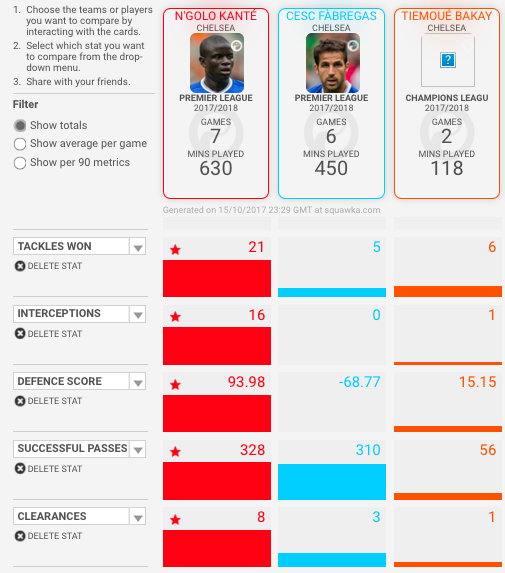 In the above stats, Kante is shown to be a dominant force in the midfield. The former-Leicester City man has made more tackles this season (21) than both Fabregas and Tiemoue Bakayoko have made combined (11), while he has made 15 more interceptions than the two, who have managed just one between them. His defensive rating also eclipses Fabregas and Bakayoko’s, with the former achieving a score of 93.98. What is most interesting is that Kante has managed 328 passes to Fabregas’ 310, meaning that the Frenchman is not just a defensive presence that cannot use the ball well. Morata was also missed massively at the weekend with his deputy clearly not up to taking up the mantle of the injured Spanish-forward. 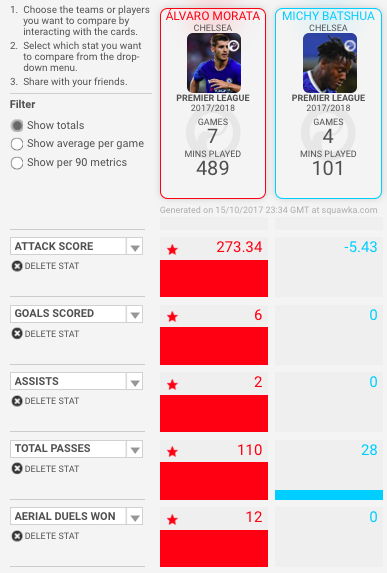 Morata vs Batshuayi (Squawka stats)This season, Morata has managed to score six goals and pick up two assists, and by comparison, Batshuayi has not registered an assist or goal. Indeed, Batshuayi’s inability to really impact upon the game against Palace is summed up by the fact he has played 101 minutes of football and has made just 28 passes. Finally, for such a powerful striker, he has been unable to win a single aerial duel this season, and Squawka has given him an attacking score of -5.43 compared to Morata’s 273.34. It is no secret that Chelsea have let a number of high-profile players leave the club this summer and it is hurting them now. Diego Costa was reportedly told he was surplus to requirements at the club and he was subsequently replaced by Morata. Costa has since departed for Atletico Madrid as he looks to get his career back on track. While Costa being allowed to leave is not the most surprising of moves, the fact that they did not bring in another replacement is incredible. Morata was brought in to replace Costa and he has done a superb job, but did nobody at Chelsea think about the possibility of the forward picking up an injury? Indeed, Batshuayi, who was used sparingly last year, was always going to be the second-choice striker if another player was not brought in, and his struggles are not surprising. After all, he is a young player that is still learning his trade. 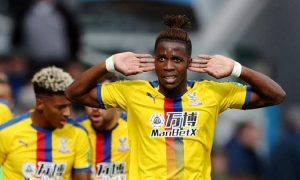 Crystal Palace would have provided a tough and compact test for even a seasoned striker as Roy Hodgson was looking to add solidity to their backline. For Batshuayi, it proved a step too far. Chelsea only have themselves to blame when it comes to their lack of cover up-front then. Perhaps the most perplexing piece of business Chelsea have done in recent years is their decision to let Nemanja Matic leave again, only this time it was to a direct rival. Manchester United pulled off a coup in signing the Serbian and their purchase is paying dividends this season. While it was foolish to let him depart for a team that will be challenging Chelsea for the title, it was an even worse decision to fail to sign a replacement. Once again, the Blues brought in a new defensive-midfielder in Bakayoko, but he is a man that is learning how to play in England and so will take time to adjust. Kante’s injury has left Bakayoko to fend for himself alongside Cesc Fabregas, who is not renowned for his defensive abilities. Indeed, Sky Sports pundit Gary Neville was perplexed by the move, saying: “I have to say that it is a strange move, it really is, to sell to one of your main rivals…There is very rarely such big transfers between champions to clubs that are challenging them and it is a strange move. And I do not think he likes it and I do not think he agrees with it because he said he has to strengthen now and fill that gap”. He went on to say: “If you think Costa, Matic and Terry are going out of a changing room, that takes some replacing. In character, experience, but also in performance. 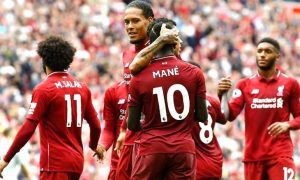 So I would think that he would definitely want more, and I think they are probably short of where he wanted them to be at this stage of the season”. Neville said the above back in August, and it was what many were thinking at the time, and it is what everyone knows now. Chelsea did not replace the men that left, and they have instead started a Premier League title defence and a Champions League campaign with a squad that is nowhere near big enough. Even though Morata and Kante are such exceptional talents that it would be easy for Chelsea to rely upon, ultimately, the Blues have had no choice but to become dependent on them. Chelsea’s own transfer-policy has seen them shot themselves in the foot then. They are entirely reliant on Kante to marshall the midfield, while Morata has to score the bulk of their goals. Now that the two are injured, Chelsea are being exposed in the middle and they are not scoring the goals to compensate for their lack of defensive cover. It’s clear that without two of their most important players, Chelsea are likely to face a very long and toilsome season. Chelsea ARE NOT “challenging for the title” this season – they are much weaker than last season and have to deal with the Champions League. It’s between Man U (favorites in my book), Man City and Spurs, on the outside!